The name "buttermilk" is confusing, leading many to believe that buttermilk is basically a buttery, high-fat milk. However, this couldn't be farther from the truth. Not only is there no butter, per se, in buttermilk, but it's actually lower in fat than sweet milk. The "butter" in the word buttermilk is not a reference to its butteriness, but rather an explanation of where this versatile fermented beverage comes from. The flavor of buttermilk is reminiscent of yogurt and most people prefer it well-chilled. You will find it to be slightly thicker in texture than regular milk but not as heavy as cream. Buttermilk is used in both sweet and savory recipes, as well as cooked dishes and baked goods. The way buttermilk is made has changed over time, and has become widely available. The buttermilk we find in the grocery store refrigerator case today is not exactly the same as the original buttermilk our grandmothers used. Old-fashioned homemade buttermilk is the slightly sour, residual liquid that remains after butter is churned. It is usually flecked with tiny spots of sweet, creamy butter that did not quite make it to the top to be skimmed, but is essentially nonfat since all of the fat went into making the butter. It takes 1 gallon of milk to yield 1/2 pint of true buttermilk. The liquid is left to ferment overnight, which converts the milk sugars into lactic acid. 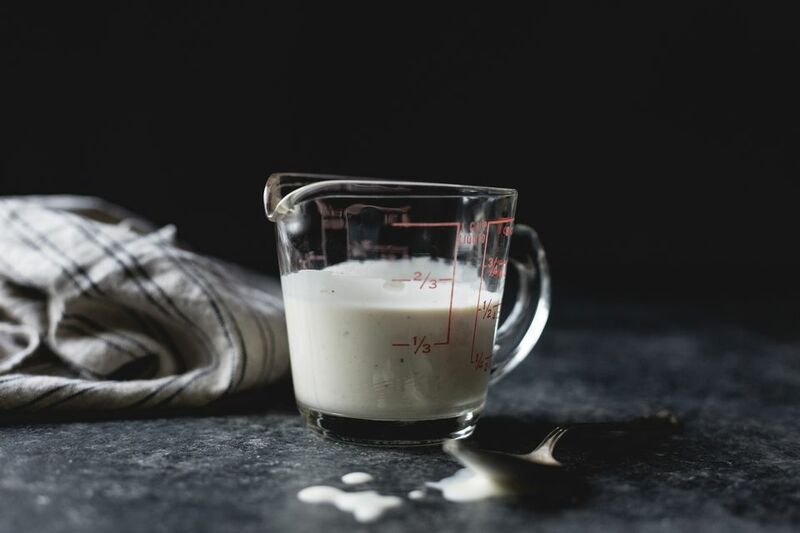 This lactic acid allowed for longer storage before refrigeration was used, and is also what makes buttermilk so desirable for baking and what gives it its signature tangy taste. Nowadays, most buttermilk is made by an industrial process that has little to do with making butter. First, a bacteria culture is added to pasteurized sweet whole milk or, more commonly, skim or non-fat milk. Flecks of butter may or may not be added as well. After the addition of the bacteria, the milk is left to ferment for 12 to 14 hours at a low temperature (optimally 69 F). Salt, stabilizers, and sugar may be added to the buttermilk. Processed this way, it is usually labeled "cultured buttermilk." Commercial buttermilk is more acidic, thicker, and has a stronger tang than the old-fashioned version. When baking recipes that require accurate leavening, it is best to use store-bought buttermilk as these recipes often include baking soda to work along with the buttermilk and help to reduce the buttermilk's acidity. Buttermilk was prized by older generations for its tangy flavor and remarkable properties in baking. When paired with baking soda, as it is in recipes such as buttermilk pancakes and buttermilk biscuits, the buttermilk's lactic acid reacts vigorously, creating a great rise and exceptional crumb. In addition, the lactic acid can be used to tenderize meats, as it is often called upon to do in fried chicken recipes. Buttermilk can also be enjoyed as a drink, especially to improve gut health and aid in digestion. The beauty of buttermilk is that it lasts longer in the refrigerator than other dairy products. The solids may separate from the liquid, but all it needs is a good shake, and if it comes back together it is ready to go. Buttermilk also freezes well; poured into portioned containers and placed in the freezer, it is always on hand for a batch of cornbread or a quick smoothie. Thaw in the fridge or on a low setting in the microwave. Buttermilk made the old-fashioned way is a rich source of probiotics. Like yogurt or kefir, buttermilk that contains active cultures can introduce or reintroduce gut flora that may have been lost due to antibiotic regimens. These bacteria enhance digestion, aid in nutrition, and combat digestive issues from flatulence to Crohn's disease. Those suffering from indigestion or reflux may find that the richness of buttermilk soothes an inflamed esophagus. Be sure that the buttermilk contains live cultures; pasteurized buttermilk will have killed off the bacteria in the process of producing all that tangy acid.